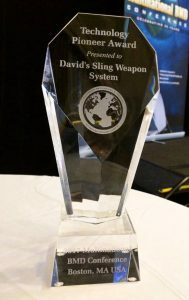 Jerusalem, Israel — October 25, 2017 … The David’s Sling Weapons System (DSWS) was awarded the prestigious Technology Pioneer Award at the 2017 Multinational Ballistic Missile Defense (BMD) Conference in Boston, Massachusetts, in recognition of ground-breaking achievements in Lower-Tier Ballistic Missile and Cruise Missile Defense. “The marvelous capabilities of Israel’s David Sling Defense System are a significant breakthrough in the world of interception technology,” said Moshe Patel, Director of Israel’s Missile Defense Organization. David’s Sling is a joint bi-national effort of the United States Missile Defense Agency and the Israel Missile Defense Organization (IMDO), of the Directorate of Defense Research and Development at Israel’s Ministry of Defense. The prime contractor for the David’s Sling Weapon System Program is Rafael Advanced Defense Systems, with Raytheon Missile Systems as a sub-contractor. The Multi Mission Radar is developed by Elta, a subsidiary of Israel Aerospace Industries and the Battle Management Command, known as the Golden Almond, is developed by Elisra, an Elbit subsidiary.